Are you having an issue with Total RP 3? Check the F.A.Q and our troubleshooting page! List of known issues and workarounds. Avoid losing all your profiles: sync up your saved data to an online storage. Here’s a guide! Don't know how to install an add-on? Check our installation guide! Check out Myth's excellent TRP3 guide for an in-depth tour of the add-on's features. Big thanks to him! Total RP 3 aims to be the best way to customize and describe your role-play interactions, by bringing together the powerful customization features from Total RP 2, new features asked by our users and a much better user interface, designed with usability in mind. With this add-on, you can fully customize all the information about your characters and companion (pets, battle pets, mounts), like the name, the description or even attach an image to represent them. Our goal is to bring back the simplicity and user-friendliness of add-ons like FlagRSP and MyRoleplay but without sacrificing your freedom when defining your roleplay characters and adding neat features that you'll never want to live without anymore. Total RP 3 implements the Mary Sue Protocol, which is also used by roleplay addons like MyRoleplay, XRP or even Total RP 2. That means Total RP 3 can understand and exchange data with all these add-ons. Also, Total RP 3 is a fully modular add-on. So even if it will greatly expand in the future, you can choose exactly which features you want to use and won't be bothered by a complex user interface if you don't want to. This is the main module which will be required to run any future expansion. You can customize your characters and companions (battle pets, pets, and mounts) with a powerful profile system and quickly switch between profiles. Keep track of all characters and companions you met with the directory, a repository of profiles you have encountered. Locate other Total RP 3 users on the world map to see where people tend to gather. You can decide to appear on the map or not, or even appear only if you are in character. A customizable target frame, allowing you to easily reach useful actions about your roleplay target (see their profile, play their theme song). NPC speeches to make an NPC say or do something during an event. Mature profile filtering to be warned before opening profiles that may contain mature content. Total RP 3 is merely a tool and is operating inside World of Warcraft's add-ons framework and terms of service. We are not responsible for your RP profiles. You are responsible for data. If you want to make sure you don't lose your data, make sure to make regular backups of them. We are not responsible for reprehensible content in RP profiles, since patch 8.0.1 you can now report players with such content to Blizzard. Here's a video made by Tarcanus Frostbourne, host of the LFRP Podcast, showing Total RP 3's main features. Here's a video from Inquisitor Aura about the latest new features in Total RP 3 for Legion! 🇧🇷 Here’s a great video tutorial from the Whitewolf Clan in Brazilian Portuguese. This awesome module brings the new creation system. Create items, readable documents, campaigns with quests, customized NPCs and dialogs, loots. Use the inventory system to show items you are wearing and inspect other players' inventory. Create stashes that other players will be able to inspect. Trade items with other players safely thanks to our security level system that allows you to define authorizations per item and be sure you won't suddenly shout weird stuff because of a cursed item! This module adds several customizations to KuiNameplates like displaying colored full RP names in the nameplates of players, customize pet names and even hide nameplates of non-RP players! Adds a standalone frame to your UI that displays your "Currently" text and allows you to edit it easily. Adds a simple button to the toolbar to toggle on and off the map scan location feature. [rp:tags] adds a bunch of new tags to ElvUI's Unit Frames system to expose Total RP 3 fields, like RP names, colors, and more, to be used on the player and target frames. ... I'll have to check on Tongues though, as a unified way of dealing with languages seems easier to implement. That would be great. I've encountered some problems in RP because of the diffrent language systems as some use TRP and some MRP or XRP with Tongues. We are aware of issues caused by the minimap button and the profiles system. We are actively working on fixing this for the next version. We are hoping to release a new build for the end of this week. Love the Addon, but after i logged out last night it completely stopped working for me i have uninstalled it and reinstalled it a few times changing between the client and manually...and I have used both /run TRP3_MainFrame:Show() and /run TP3_API.configuration.CONFIG_FRAME_PAGE.elements.callback(). And it will open the Addon window..but none of the options for the addon are working. it was working last night..but after updating ElvUI is when the problem started..so just wondering if its Elv..or just something else..after some testing..no matter what i do the map button will not work..and there are no options showing up in the addon. I love it. It's really cool how you can add your own stats to your information. I kind of miss having the ability to make custom items. And, as a sidenote, today, when trying to queue for a bg, I got one of those ignore/disable error popups and it said TRP3 was the culprit. Just a headsup. Good work, keep it up. oh, is it possible to add a feature to track people on the map like with carbonite if, say, you added them to friendly or something like that under relationship? Seems like it would be neat if you could add that. Hello. Thank you for your feedback. About the BG issue, the function used by Blizzard to point at an add-on is hazardous. It might say it comes from an add-on using the said function but the issue comes from another add-on using the same function. We have no lines of codes using the BG queuing system, so I don't see how it could come from us. We will check, to be completely sure, but could you try with only Total RP 3 on and confirm wether it comes from it or not ? Thank you for letting us now about his. I don't think it's from the profiles imported from Total RP 2. If they work on one character they will work on all of them, they are bound to the account, not a specific character. I'm thinking the issue here is still the minimap button. Something happens at loading that prevent the addon from being displayed correctly, and as the minimap button is not displayed I'm thinking it comes from here. You can enable Lua error reports in the setting Interface -> Help -> "Display LUA errors". Could you tell us if an error happens at loading and in that case could you paste the bug report here ? Here is the error from a non-working character. (*temporary) = "Unavailable profile name: Muiren - Wyrmrest Accord"
Interesting notes: Working profiles have names in SavedVariables like "Muiren-WyrmrestAccord", non-working profiles have names like "Muiren - Wyrmrest Accord". Formatting issue? Thank you for pasting the Lua error. It helped us a lot. We fully understand where the issue come from and we will fix this for the next version. Until then, the work around would be to rename the profiles imported from Total RP 2 named after the characters you are trying to log in (for example, for your toon Muiren - Wyrmrest Accord, rename the currently existing profile "Muiren - Wyrmrest Accord" from your character that don't have this issue). It seems that our minimap button is beeing silly lately. Can you try running this command to reset the minimap button position /run TRP3_API.configuration.CONFIG_FRAME_PAGE.elements.callback() ? You can also use this command to show the main frame /run TRP3_MainFrame:Show() and reset the minimap button position in the settings (we will make easier commands in the future). Hi Ellypse, I'm having the same issue many others are having regarding the non-responsive minimap button. 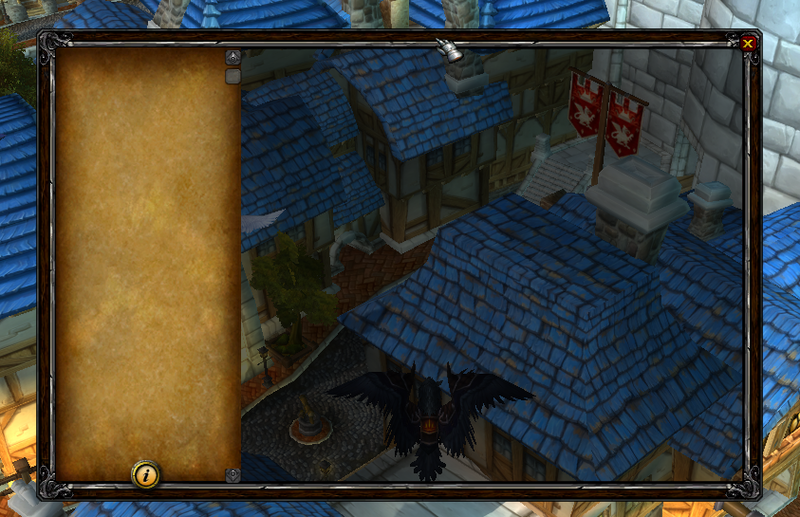 However, on top of that, I am unable to interact with the addon at all. It seems to load as it gives the welcome message, and has the minimap button appear. However, unless I am on the very first character I used TRP3 on (and imported my TRP2 profiles from), the addon is unresponsive. I cannot click the minimap, and using the /run TRP3_MainFrame:Show() command (or the reset minimap command you also noted) results in abnormal behaviour. The screenshot shows the window that pops up-- I cannot interact with the window at all except to close it. edit: I cleared the TRP3 SavedVariables, reinstalled TRP2, imported all profiles on Character 1, and after disabling TRP2 TRP3 acts as expected on Character 1. But any other character experiences the freezing issues. I'm thinking its an issue with profiles imported from TRP2 not parsing properly on character load, except if its the active character...? I can totally understand the reasoning for not having the databroker, and that's fine, I can do without it. I do currently have my custom statuses set in the 'current' field, but, that's all fine and dandy for other TRP3 users, however, those not using it, (there are a lot of MRP users on WrA) won't see it at a glance when looking at the tooltip of another player. They'd actually have to be bothered to select me, and view my profile just to see it. And in any case, I always thought of the 'currently' section as being IC info and not OOC. I implemented databroker in Total RP 2 for the minimap and it worked nicely with "minimap button collectors". However, it added a LOT of librairies to the add-on. Telkostrasz doesn't like to have so many librairies just for a button and we decided together to not use databroker in Total RP 3. I'll discuss this again with him, using your message to argue, but I can't promise anything for now. I understand your point about custom statuses. We actually want to add the "looking for contact" that MRP has and we are missing. I'm not sure about custom statuses though, as, unlike MRP, we are using the RP status in more part of the add-on than just displaying it as is. Adding custom values prevent us from using standard values (on/off) for more features. Also, Total RP 3 allows you to add a "currently" OOC, where you can add information like "LFC / Walk ups welcome (8+ years)" or any other information (youtube link to a theme, link to your guild's website) that other players will see in the tooltip. It could be used for custom statuses. Hi, just wanted to say, this is amazing work so far! I think I may finally change from MyRolePlay to this after all these years. I wanted to ask, being a person who uses a databroker bar, would this be able to support that one day? I'd rather have no minimap button and have it instead in my databroker bar at the top of my screen. Could custom statuses be implemented? That would really be the deal breaker for me, and I'm sure for many others on the WrA server. So many of them use the custom statuses to describe the type of RPer they are. Hang on a minute... why can't I delete profiles? Yes, it's not really obvious for now. We are planning on adding more tooltips and help frames. Template 1 is free form. You can create headers, paragraphs and make your own soup ^^ Template 2 is free form too in the way you can add whatever category you want, model it the way you want. Template 3 is more organized, you have categories for your physical description, personality and your history. You can choose one, and that's the one othes will see (you don't have to fill them all ^^).